St John on Bethnal Green, 200 Cambridge Heath Rd, London. The first GHost exhibitions took influence from the phantasmagoria ghost shows. 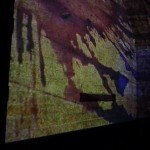 Projections, sounds, smells, performances, made for an immersive experience. 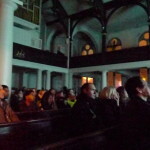 The atmospheric venue of St John Bethnal Green was used to full effect. GHost’s AV technician installed a huge movie sized screen in the nave and it is still used by the venue to this date. We made our first show reel of short international artist ghost films, selected from an open call. 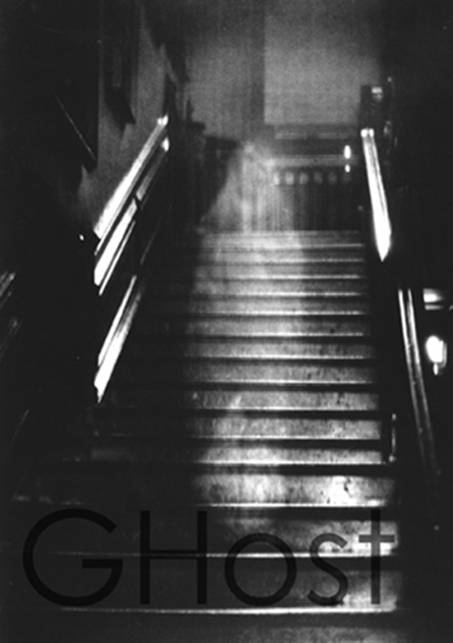 The GHost show-reel became a regular feature of GHost exhibitions. Artists: Federico Campanale, Ami Clarke, Andrew Cooper, Jo David, Lisa Fielding-Smith, Tessa Garland, Magnus Irvin, Richard Mansfield, Sabine Schöbel, Nikki Sehmi, Reverend Marc Vaulbert de Chantilly, Rosco S. Treadaway, Darshana Vora,, Phil Wilson-Perkins. The Parochial Church Council at St Johns on Bethnal Green. “Anomaly”Jo David, UK, 2008, film, 15 min loop. The film shows the artist’s encounter with an urban fox one night in spring. The creature’s wild nature is highlighted by the urban setting and its reaction upon sensing the ‘watcher’ is eerie and magical. What follows is an exhibition of behaviour that is challenging, even menacing and yet, there seems to be an underlying longing for some kind of connection between the animal and the human. ‘Stella and George’ uses stop-motion and hand-drawn animation to create a story about a family memory stored within old domestic furniture. Stella and George emerge from an old piano leg and a door frame respectively and go looking to be re-united with each other. One TV shows the story of Stella, the other the story of George. The hand-carved wooden TVs become containers for the spirits of these lost souls. Sarah Sparkes’s work ‘you are here’ consists of a ply wood coffin, built to fit the artist, and standing on two trestle tables. Through a peep hole, in the foot of the coffin, the viewer has a glimpse of a twinkling tunnel of lights disappearing out of site. Treadaway’s red lanterns form a line of twinkling grave-lights and scent conjuring the eerie experience of olfactory after-death communications and the feeling of an otherworldly presence. The film is shot in an empty apartment where wine bottles fall from a height to shatter on the floor. Wine like blood runs along the floorboards. Through shifting camera angles perspectives become mixed up so that the outside appears to be inside and vice versa, while the red stains slowly retract onto themselves and disappear. This strange film focuses on a small wicker chair that moves of its own volition. The chair is made of some ephemeral material that conjures the microscopic look of human tissue and questions the reality the human eye allows us to perceive. Price’s triptych is a beautiful and tranquil enquiry into the spirituality of objects. In ‘The touch that moves’ two opposite entities come into contact with each other and create a whirlpool in space. In ‘They Fly with Us’ we look through the window of a plane cruising at high altitude and watch a winged creature follow our flight. The final piece, ‘The Dance of Waiting’, was shot in the belfry of St John’s and offers visitors a rare glimpse of a delicate otherworldly creature that has made the belfry its home and feeds on the sound of bells. “All Souls’ Night” The Reverend MARC VAULBERT DE CHANTILLY Performance in the Foyer and Church. 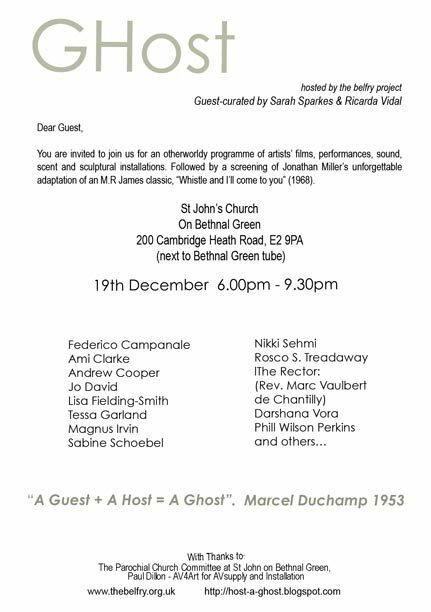 Taking inspiration from Keats’s Poem, “All Souls’ Night”, The Reverend Marc Vaulbert De Chantilly will become the host of ‘GHost’. Throughout the night he will invite and welcome guests, both seen and unseen, to find succour during the long dark midwinter night. During the film screening, his shadowy, candle-lit silhouette will be glimpsed just outside of the frame of vision, still and constant in his waiting. Inside the church and unseen to everyone a strange musician is playing an unconventional score. 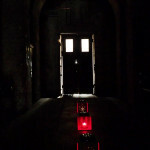 As the music seeps through the closed doors of the church the visitors are subjected to a series of ‘subliminal messages’. All the sounds in the piece have been extracted from the ‘spoken texts’ in the Bible, The Bhagwad Gita and the Quran. Each sound is hence a word, relating to the scriptures describing paradise/heaven. 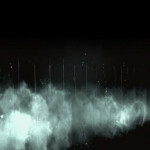 A bullet is fired through a succession of glass panels in a blacked-out room. The only light is the spark of the bullet which lights up the shards of splintered glass as it passes through each panel. 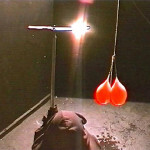 The action is shown at different speeds and from different angles. The only sound is that of splintering glass. A beautiful and eerie film. This is the third part and compendium to Cooper’s installation. Will Stella and George finally be reunited? This supermarket horror film is based on George Romero’s 1960’s cult film Night of the Living Dead. In Zombie, an ordinary supermarket becomes a film set, where the shoppers become unsuspecting actors in a short but climatic horror sequence. Zombie was shot on a mobile phone camera which gives the film its style of part surveillance, part disposable and throw-away. The assailant begins well poised for the act. There is a transformation from total control to the ridiculous and then desperation. The observer is unfortunately encouraging the inevitable rather than offering salvation. Find out where Belisha Beacons come from. Behold the transformation of a man into an item of street furniture. See the ferocious, jumping beacon hand wreak vengeance on the callous Mr. Podomowski. Witness the birth of a Belisha Beacon. The original footage depicts six lead toys: a huntswoman, a land army girl, a milkmaid, a nurse, a lady bowls player and a flower girl. The figures have been burned one after the other in flames (poisonous fumes). The footage is then reversed emulating the figures to resurrect from the embers of fire. Shot in black and white with the eerie voice of an unseen narrator, this film has a charming yet unsettling quality that evokes the spine tinglers of those classic days of the BBC Christmas Ghost story.